Instructors of Steve Aron's Academy of Fighting Arts, L to R, Jay De Leon, Tony, Sifu Steve Aron and Phil Rapagna. 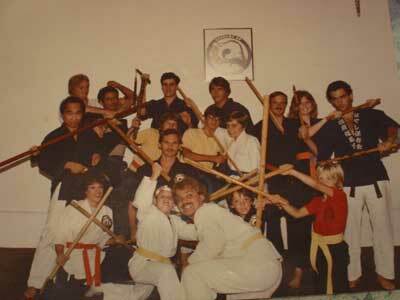 Sifu Steve Aron was a first generation Parker Kenpo Instructor and a Certified Instructor of Inosanto Kali. Since then, he has also become a JKD Certified Instructor under Pete Jacobs and a JKD Nucleus Member of the Bruce Lee Education Foundation, and currently operates a Dojo in Glendora, CA. 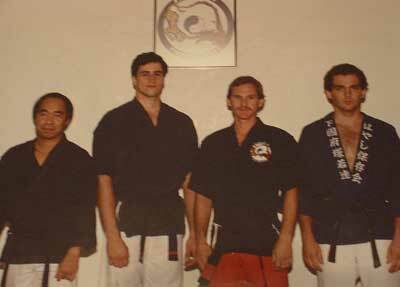 Phil Rapagna subsequently also became an instructor of Lameco Eskrima under the late GM Edgar Sulite, and is currently a Pasadena Police officer and Law Enforcement Trainer. Steve Aron's Academy of Fighting Arts's cirriculum included Parker Kenpo, JKD, Wing Chun, Penjak Silat, and Inosanto Kali. This impromptu group picture took place during a break between the kids' class and the adult class. Kenpo Sifu Jay De Leon leads a Kenpo Team Kata Demo. The other taem members include Joyce Johnson, Linda Daniels, and Michael Johnson. Maestro Jay's ID Card for the "Phil. Combat Karate Judo Association" or Phickaju. 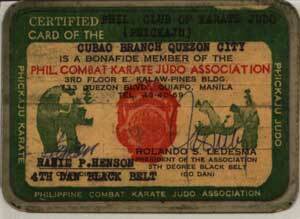 This large commercial dojo in Manila, Philippines taught Shorin-Ryu, Judo, and Arnis. This was Maestro Jay's last commercial school before leaving for the U.S. in 1974. 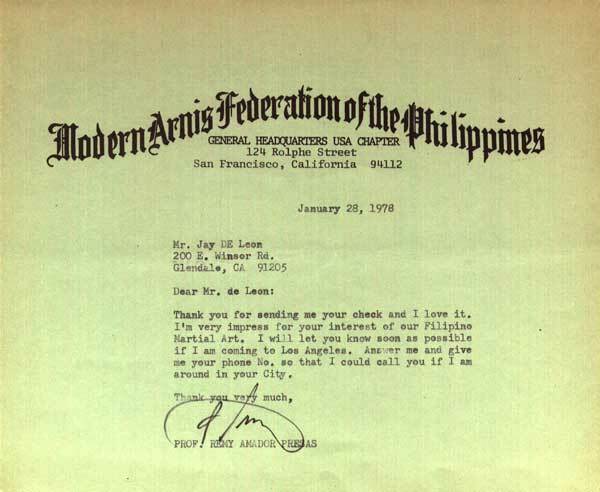 First correspondence dated January 28, 1978 from Prof. Remy Amador Presas, father of Modern Arnis. Maestro Jay trained with Prof. Presas in Los Angeles for a short while, and maintained a friendship and attended several of the professor's seminars for the next two decades until Remy's recent death.